SPEED REDEFINED. Print up to 8 models in 15 minutes with the new EnvisionTEC ONE D printer from EnvisionTEC. Contact 365 Printing to learn more! PERFECTLY FITTING DENTURES IN NO TIME! 3D Print natural-looking appliances with exceptional customized fit with FDA-approved E-Denture and E-Dent 400 printing materials from EnvisionTEC. Contact 365 Printing to learn more! Not all 3D printers are created equal. Find out why EnvisionTEC 3D printers deliver the highest accuracy, making them the clear choice for orthodontists, dental professionals and labs. The Vector Hi-Res 3SP by EnvisionTEC featuring fast print times and high resolution output, is an ideal choice for high-volume dental or orthodontic labs as well as large orthodontic practices. EnvisionTEC, a leading global manufacturer of desktop and full-production 3D printers and materials, today received FDA approval for its new E-Denture material for the 3D printing of lifelike dentures. Owner Luke S. Kahng of LSK121 Oral Prosthetics operates one of the most successful and innovative dental labs outside of Chicago. Kahng bought his first Vida from EnvisionTEC in the fall of 2016, followed quickly by EnvisionTEC’s Vector Hi-Res 3SP. EasyRx and 365 Printing announce special AAO pricing! Purchase a EnvisionTEC printer from 365 Printing at the AAO and receive EasyRx Standard Plan subscription for 1 year. Contact us today for more information! Bryan Delano, Co-Founder of Renew Digital, delivers an informative article on orthodontic offices getting ready for in-office 3D printing. August de Oliveira discusses dental 3D printing with EnvisionTEC, the industry leader in DLP printing technology, at the 2017 IDS. E-IDB is suitable for printing indirect bonding trays, allowing for fast, accurate application of orthodontic brackets that release with ease. Using the material in an EnvisionTEC Vida 3D printer, four custom trays can be built in 45 minutes, with little-to-no need for post processing. 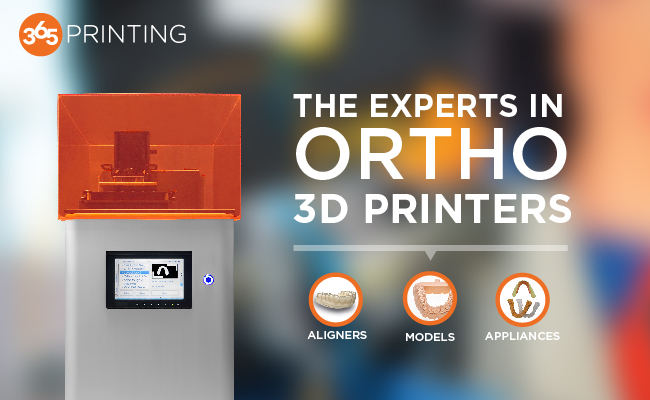 Los Angeles Convention Center 1201 S. Figueroa St.
3may - 7All DayAAO Annual Session 2019 - Booth #2210Join 365 Printing at the AAO Annual Session to learn how ortho 3D printing can streamline your orthodontic practice! 18oct - 19All DayMother of Pearls Orthodontic Conference 2019Join 365 Printing at the Mother of Pearls Orthodontic Conference and see our 3D printers "in action!" We’ll show you how your practice can benefit from 3D dental print. We even provide sample models so you can visualize the high-quality results.